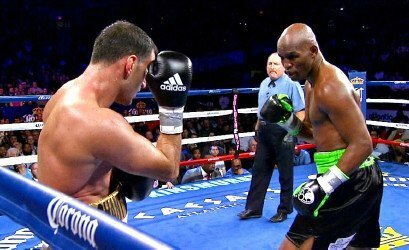 Making his first defense of his IBF light heavyweight title champion Bernard Hopkins (54-6-2, 32 KO’s) defeated Karo Murat (25-2-1m 15 KO’s) by a lopsided 12 round unanimous decision on Saturday night at the Boardwalk Hall, Atlantic City, New Jersey, USA. The final judges scores were 117-110, 119-108, 119-108. Hopkins took a lot of shots in the fight and it was a lot of back and forth action between them. This was easily the most exciting Hopkins fight in quite some time. Hopkins options for his next fight are Mayweather, Adonis Stevenson and Sergey Kovalev. Hopkins didn’t mention Stevenson or Kovalev after the fight though. Hopkins was better than Murat and hurt him several times in the fight with big shots. He cut Murat’s left eye in the 8th round. WBO middleweight champion Peter Quillin (30-0, 21 KO’s) defeated challenger Gabriel Rosado (21-7, 13 KO’s) by a 10th round cut stoppage. Rosado suffered a bad cut over his left eye late in the 9th round. The fight was halted due to the cut at the started of the 10th. It then went to the card with Hopkins winning by the scores 90-80, 87-83 and 89-81. Quillin dropped Rosado in the 2nd round from a right hand to the head. In the 4th round, Rosado staggered Quillin with a couple of hard right hands. Quillin was able to survive the round though. Rosado was looking for one big shot from rounds five through eight. Rosado started coming on in the 9th and he was looking really good up until he suffered a cut. Unbeaten heavyweight knockout artist Deontay Wilder (30-0, 30 KO’s) put on a punching display tonight in destroying 34-year-old journeyman Nicolai Firtha (21-11-1, 8 KO’s) in the 4th round TKO. Deontay landed a tremendous right hand in the 4th round that dropped the bleeding Firtha down hard on the canvas. The referee then stopped the fight. Deontay knocked Firtha down four times in the fight all total. He knocked Firtha down twice in the 1st round, once in the 3rd and the last coming in the 4th. The first knockdown in the first round came from a hard jab from Deontay. It looked like Deontay then pushed Firtha down but the referee still counted it as a knockdown despite the push. Later on in the round, Deontay hit Firtha with a hard right hand while backing up that put Firtha down. In the 3rd round, Deontay dropped Firtha with a a hard right hand that sent him down through the ropes. Firtha surprised Deontay in the 1st round by nailing him with a hard jab that knocked Deontay off balance. The crowd got excited thinking that Deontay was hurt. He wasn’t though. It was just a balance thing with Deontay getting hit while he was moving. Firtha immediately starting pressuring Deontay even more in bum rushing him, but Deontay moved well and as able to keep out of the way of Firtha’s shots. Deontay showed a lot of power once he started throwing his right hands and left hooks, and he Firtha’s nose bleeding badly by the end of the round. At point Firtha grabbed Deontay in a clinch and Deontay responded by nailing him with a flurry of clubbing right hands to the side of the head. The punches were thrown with a lot of speed and they looked very powerful. Firtha showed a good chin to take those shots. In the 2nd round, Deontay slowed the action down a little as he looked slightly gassed. However, he also appeared to be looking for one big highlight reel shot to land. He barely missed with several huge right hands that likely would have knocked Firtha out had he took them on the chin.